Federal Contracts and Grants (2010 - 2015). "Revenues from federal contracting ($25B) now exceed undergraduate student tuition ($22B)..."
online videogame where you listen to voicemails from 50-years in the future describing how the earth has been destroyed by Climate Change. Play here. 2. Recession Inspired video game (Dartmouth, $137,530) - game called Layoff - you are charged with firing as many people as quickly as possible - until you get a bank bailout. Bankers cannot be fired, because businesses need their government bailout monies through the bankers. Play here. 3. $24M in Small Business Administration grants to UPENN - that's not small business. 4. $13M in National Arts/Humanities grants - chamber music, Asian Art, classical opera. 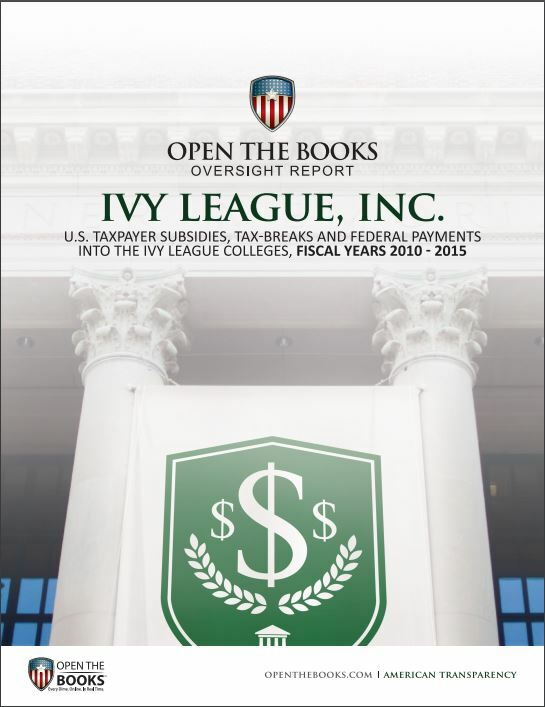 The Ivies have a $120 BILLION endowment for this stuff! Learn more: Read our OpenTheBooks report, here. Turning Point USA, College Fix, Campus Reform and many others. The tools of transparency have given the American people and our political leaders the chance to see waste like never before.